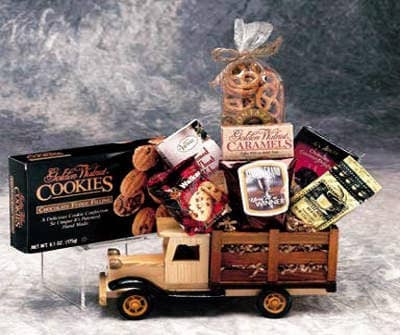 A keepsake solid wood antique truck carries a load of sweet and savory goodies that can be enjoyed at home or at the office. For the antique buff or the truck fanatic, this is the perfect gift for the man in your life. A beautiful solid wood antique truck carries a load of sweet and savory goodies that can be enjoyed at home or at the office. After the goodies have been devoured, the lovely truck remains to grace the gentleman's desk or mantel. You're sure to please when you select this gift basket. Stone Wheat crackers 5 oz.